When did you last give yourself some time? Time to re-examine and connect with your values. Time to work on your business rather than in it. My guess, if you’re anything like me, is that time for yourself tends to be last on the list. And yes, it’s the first thing to go when something’s gotta give. Well, I’m here to remind you (because I know that you know…) about just how important it is to allow yourself time for both professional and personal development. I’m fresh off a plane back from San Francisco (maybe ‘fresh’ isn’t the word, but I’m back! ), where I spent two weeks. It was a combo of work and play – after attending a week long conference on innovation, exploration and the changing needs of our clients, I enjoyed a much-overdue visit with a dear friend who’s Stateside these days. We spent a glorious few days soaking up the delicious food and wine in the stunning Napa Valley and catching up on long overdue connection. As I often find after lots of networking, my head was swimming with ideas and inspiration after the conference and my time with my friend – but I needed some downtime to recharge. So, I booked into a beautiful hotel in Berkeley for three days and … oh my goodness … it was just what I needed. And then some. Aside from lapping in the stunning bay views over my fave cup of Earl Grey, I used that alone time for strategic planning. What do I mean by that? I scheduled two days for myself – a personal planning day and a professional planning day – and I honoured that scheduled commitment. I set an agenda for both days and stuck to it. And I treated this appointment with myself just as seriously as an appointment with another colleague or client. I’ve stuck to doing this every year for 3 years now, and these are three key elements that I’ve come to expect as part of the process. Through reflection and honesty, I gain clarity – both about where I’ve been (and why) and where I’m going. Reconnecting with my vision gives me the courage to express inner truths. And that leads to renewed optimism – a sense of empowerment and reconnection with the belief that I can make an impact in my own quiet, authentic way. Whatever you want to call it (and I’d love to hear your suggestions), the important thing here is that you plan the time. You honour the time (and yourself). And you DO it. Wondering how I structure my reflective days? I’m working on a resource to help you with this but in the meantime, there are certain exercises that I go through every time that I want to share now. 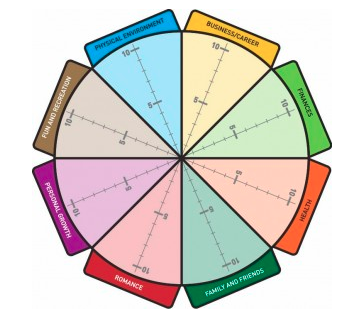 As a starting point to my personal reflection, I always do the Wheel of Life exercise, which is a common coaching tool (for good reason) to give you a snapshot 10,000 foot view of your life right now. Wowsers! This time, I discovered that my personal health needs to occupy a much higher rung on the ladder. While I knew deep down I needed to do more to nurture myself, I’d been putting it to the back of the pile. Through doing this exercise and mapping it out on paper, I now had to openly admit how glaring the need was not only for my own personal health but for the health of my relationships and my business. With both my personal and professional development, I like to start big then get specific. So, after realizing my personal health needs to be a higher priority, I asked: What does the healthiest version of myself look like? What types of things would I do differently? What would contribute to my sense of self-care? From there, I broke down monthly and then weekly goals. For my professional day — again, it’s a day to work on the business rather than in it — the most important thing for me is to re-examine and reflect on my values to make sure that the work I’m doing is in alignment with those core truths. As I’ve said before, my vision and values are a constant guide, my North Star, and they help me navigate in the right direction (and by that, I mean the direction that’s right for me, not according to someone else’s values). With my values top of mind, I then looked ahead. Where to? But in asking that question, I wasn’t simply thinking about accomplishments or tangible milestones; I was reflecting on how I want to feel in the next year. For me, when I’m connected to my core values and acting on them, I feel a sense of joy, freedom and abundance – and that’s what I aim to create more of, in the most genuine way I can. At the end of my Clarity-Expression-Optimism Days, I felt rejuvenated. Like the million tabs that are always open in my head were finally consolidated and under control (because as introverts and over-thinkers we tend to always have too many tabs open). I had a clear sense of what practical steps I need to take to get where I want to go next. Everything from spending more time physically moving every day to getting out for a dose of sunshine and planning/prepping my meals. I felt conscious of my determination to speak up more. And I felt — finally — less guilty for taking some time to myself. Because, as we all know intuitively, only by valuing and taking care of ourselves can we continue to give others our best. 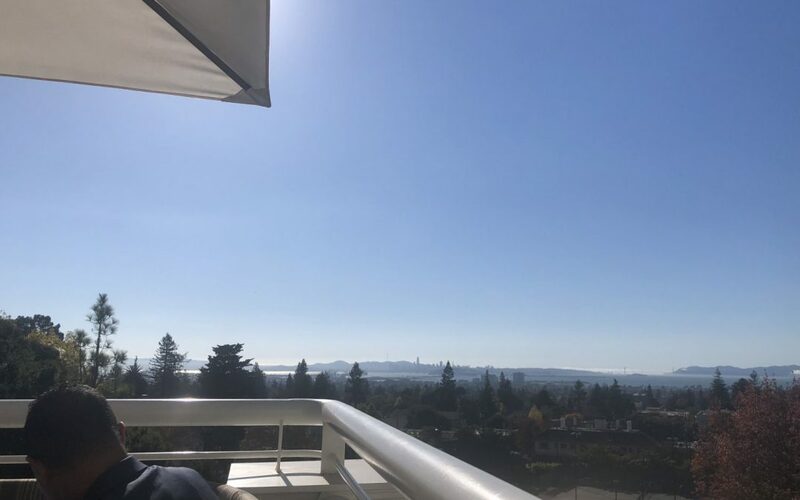 And… I must say… I didn’t feel even remotely tired of that gorgeous view of the San Francisco Bay, a view that I’ll keep close in my mind’s eye to help me reconnect and recharge when I’m feeling depleted or doubtful. Now, it’s your turn to reflect. I was so lucky – and I’m so grateful – that I could spend a few extra days in such a beautiful location as California. But, you don’t have to embark on a long-haul flight to reconnect with yourself and your business. Maybe you can plan a free afternoon when your family isn’t around and take up a table and chair in your garden. Or maybe you decide to commit to some reflection exercises along with a fellow introverted friend who’s also working on their business. Again, the most important thing is that you plan the time – whether it’s quarterly or annually – and then stick to it.